1. Discuss the incidence of disasters. 2. Describe the role of undergraduate nursing students following disasters. 3. 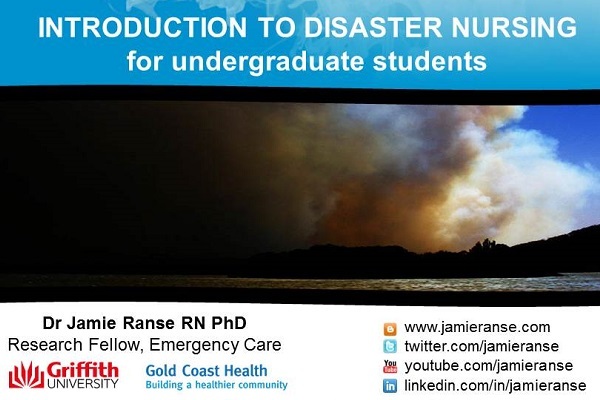 Discuss the willingness and role of nurses following disasters. 4. Illustrate key concepts in (disaster) triage. A disaster can be defined as ‘a serious disruption of the functioning of a community or a society causing widespread human, material, economic or environmental losses which exceed the ability of the affected community or society to cope using its own resources’ (United Nations Office for Disaster Risk Reduction [UNISDR], 2009, p. 9). From a health perspective, this can relate to natural disasters, pandemic-like disasters or disasters that are human-made such as chemical, biological, radiological, nuclear or explosion (CBRNE) in nature. Internationally, on average, there were 384 disasters annually for the decade 2004–2013, affecting 199.2 million people and resulting in 99,820 deaths. During this decade, three disasters led to deaths well above the annual average: the Indian Ocean tsunami [226,408 deaths], Cyclone Nargis [138,366 deaths] and the Haiti earthquake [225,570 deaths] (Guha-Sapir, Hoyois & Below, 2015). In addition to a human cost, disasters have an economic cost. During the period 1980–2012, the World Bank (2013) reported an estimated US$3.8 trillion loss related to disasters. These disasters were primarily (74%) related to extreme weather events (World Bank, 2013). There is an increasing international body of literature relating to the role of nursing students and schools of nursing following a disaster. From an Australian perspective, the literature is speculative of what some possibilities may be for students in disasters, such as assisting in the department or unit where students undertook their most recent clinical practice experience (Cusack, Arbon, & Ranse, 2010). Following a disaster, nurses undertake a variety of roles in a variety of settings. Following the 2009 Victorian Bushfires, nurses did not focus exclusively on clinical activities. Instead, nurses undertook minimal clinical activities, spending most of their patient contact time coordinating care, problem solving and providing psychosocial support to colleagues and members of the disaster affected communities (Ranse, Lenson & Aimers, 2010; Ranse & Lenson, 2012). Not all nurses may be willing to assist following a disaster. There are a number of factors that influence a nurses willingness to assist, such as the type of disaster and commitments at home (Arbon, Cusack, et al., 2013; Arbon, Ranse, et al., 2013). Nurses are more willing to assist following a natural disaster when compared to a human-made disaster such as a CBRNE event. The key principle of triage is to do the greatest good for the greatest number of people. In normal day-to-day activities, this involves caring for the patient with the highest acuity and health needs first. However, following a disaster, there may not be an appropriate level of resources to assist in the care of all high-acuity patients. As such, triage is reversed, whereby to achieve a goal of doing the greatest good, those patients with a lower acuity may be cared for in the first instance. There are a number of algorithms designed to support decision-making during triage (Ranse & Zeitz, 2010). Arbon P, Cusack, L, Ranse J, Shaban R, Considine J, Kako M, Woodman R, Mitchell B, Bahnisch L, Hammad K. (2013). Exploring staff willingness to attend work during a disaster: a study of nurses employed in four Australian emergency departments. Australasian Emergency Nursing Journal.16(3):103-109. Arbon P, Ranse J, Cusack L, Considine J, Shaban R, Woodman R, Bahnisch L, Kako M, Hammad K, Mitchell B. (2013). Australasian emergency nurses’ willingness to attend work in a disaster: A survey. Australasian Emergency Nursing Journal. 16(2):52-57. Given what you have learnt from the above two manuscripts and the YouTube presentation provide an answer to the following scenario: You are a nursing student who is on their way home from a clinical shift in the medical ward of a local hospital. As you are commuting home, a bushfire impacts the suburb near your home and the local hospital. Question: Are you willing to assist with this disaster? Provide a justification for your answer. Question: What do you think your role will be following this disaster? Provide a rationale for your answer. Ranse J, Lenson S, Luther M, Xaio L. (2010). H1N1 2009 influenza (human swine influenza): A descriptive study of the response of an influenza assessment clinic collaborating with an emergency department in Australia. Australasian Emergency Nursing Journal. 13(3):46-52. Ranse J, Lenson S. (2012). Beyond a clinical role: Nurses were psychosocial supporters, coordinators and problem solvers in the Black Saturday and Victorian bushfires in 2009. Australasian Emergency Nursing Journal. 15(3):156-163. Ranse J, Shaban R, Considine J, Hammad K, Arbon P, Mitchell B, Lenson S. (2013). Disaster content in Australian tertiary postgraduate emergency nursing courses: A survey. Australasian Emergency Nursing Journal. 16(2):58-63. Ranse J, Zeitz K. (2010). Chapter 5: Disaster Triage in Power R, Daily E (eds). International Disaster Nursing. World Association of Disaster and Emergency Medicine with Cambridge Press. pp:57-79. United Nations Office for Disaster Risk Reduction (UNISDR). (2009). UNISDR terminology on disaster risk reduction. (UNISDR-20-2009). Geneva. Usher K, Mayner L. (2011). Disaster nursing: a descriptive survey of Australian undergraduate nursing curricula. Australasian Emergency Nursing Journal. 14(2): 75-80. World Bank. (2013). Building resilience: Integrating climate and disaster risk into development: Lessons from World Bank Group experience. Washington, DC: The World Bank.